The 25 Most Dangerous Highways in the United States Calculated by Fatalities Per Mile #Infographic ~ Visualistan '+g+"
Traffic collisions is the 7th leading cause of death in the United States. Claiming nearly 40,000 lives each year, that is 40,000 people that could have lived to see another day and could still be here with us today. To put this into perspective, about 100,000 people die of old age each day. Auto accidents is at about 1% of that number! To start to study the most dangerous roads and the most deadly highways in the United States, we need to look at the data. Luckily, the folks at TeletracNavman.com already have. 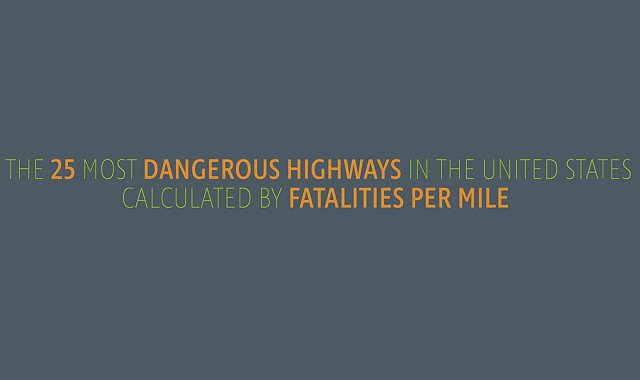 This map shows the most dangerous federal highway by total traffic fatalities per mile. You might be surprised to see that the southeast, deep south, and southern California are where the majority of the most dangerous roads exist. Overall I-4 in Florida is the most deadly highway per mile and is surrounded by many more of the nation's deadliest highways as well. What is Florida doing differently? We may never know.